Revel in the rustic beauty of the Knightsbridge Oak Stool Brown, a traditional design with stunning details. Set to add visual interest to your kitchen or bar area, the Knightsbridge is a fabulous combination of classic and contemporary style. 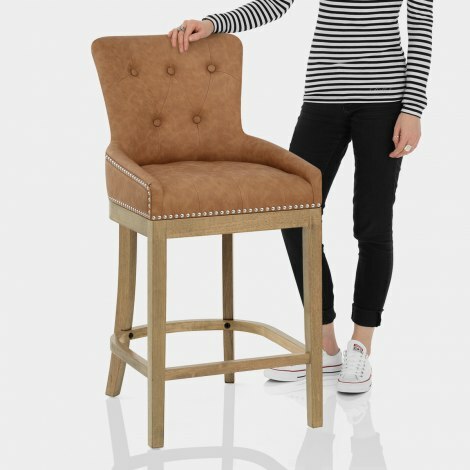 Boasting a belted frame for unprecedented comfort, the seat is upholstered in gorgeous antique brown faux leather. 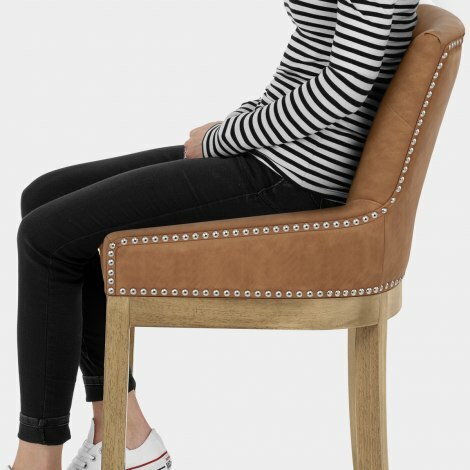 Adding opulence, the seat and high back are adorned with deep button detailing and also feature metal stud edging. A solid wooden frame supports the seat, combining four legs and strong bracing bars that also provide a footrest. With an antiqued oak finish the fixed height frame has a chic country aesthetic and also includes protective floor plugs for practicality.